Tyler Starr, Artist's Statement: "Combining research and direct observation, Tyler Starr’s publications from Wobble Press visualize political and social conundrums in such forms as prophetic KKK motorcades from declassified FBI documents and backdrops of tragic events. Poetic associations are coupled with meticulous investigation of material from primary documents to shed light on unresolved civil rights issues, fringe political movements, and bureaucratic infrastructure created in response to amorphous problems. 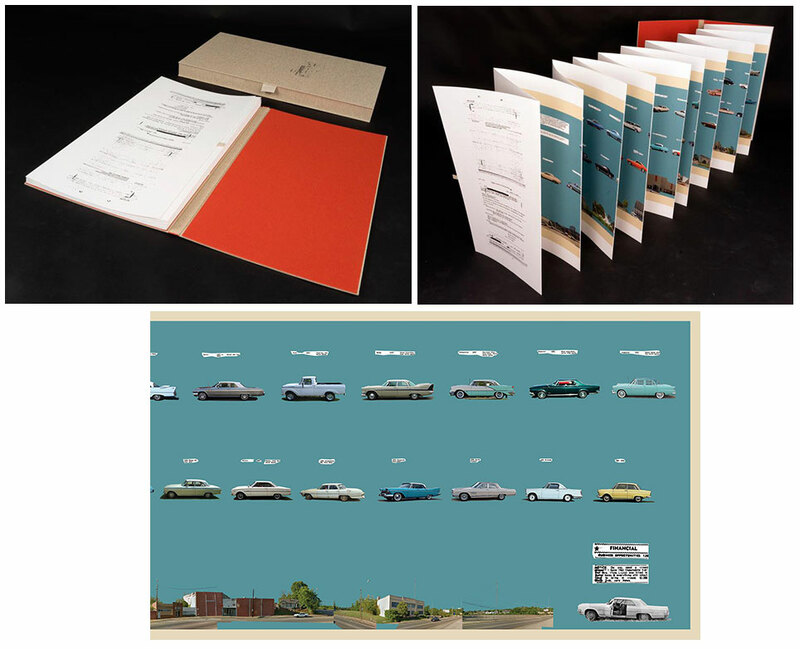 The forms of his visualizations are based on printed ephemera such as touristic brochures that present digestible history of sites with troublesome associations, souvenir postcards, and used car classifieds found at truck stops. Starr makes use of intelligence reports released through leaks and the Freedom of Information Act that were generated around violent opposition to Civil Rights and desperate solutions to complex problems. His work explores ways that printed information maps human endeavors." Davidson, North Carolina: Wobble Press, 2017. 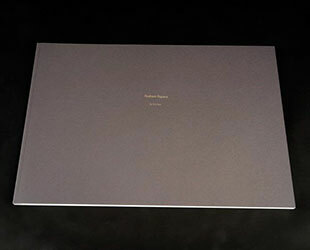 Edition of 15 + 2 AP, 1 Handling Copy. 12.5” x 23” x 1” closed, 19 panels, extends out to 230”. 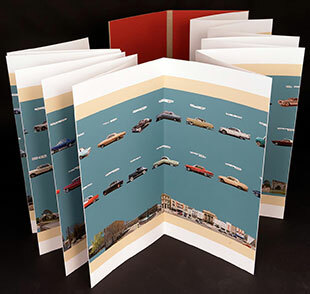 Accordion book, hard cover with doublures, foil stamped cover. Extends from back pastedown. Pigment print on Canson Edition Rag 310gm. Bound into cloth-covered boards. Laid in clamshell box. Signed and dated by the artist. Tyler Starr: "This work reconstructs a KKK motorcade that the FBI linked to the murder of the civil rights worker Viola Liuzzo on March 25, 1965. The car that carried Liuzzo’s killers participated in a 93-car motorcade organized by the United Clans of America, Inc. that traveled through Montgomery on March 21 as a counter-demonstration against the Selma March. Auto classifieds were used to find photographs corresponding to each specific description (year, make, model and color) of the KKK affiliated vehicles identified in FBI documents. A panoramic retracing of the parade route was created using Google Map based on the KKK’s parade permit that is also included in the book. "Another aspect of the case of Viola Liuzzo explored in the piece was the attempted sale of the vehicle that Viola Liuzzo was killed in as a 'Business Opportunity' to draw crowds. Microfiche was used to find the classified advertisement which was collaged into the work. "This project was completed with support from a Puffin Foundation Grant." "The small images of cards – all manufactured between 1948 and 1965 – are set off against a neutral ground in two long rows above an array of buildings Starr … photographed along the parade route through downtown Montgomery. "Also incorporated into the piece are a couple of collaged texts. One of these is an FBI summary of the investigation into Liuzzo's murder, including the names of all four suspects, none of whom were ever convicted. Even more shocking is the other text, a classified advertisement published in a Montgomery newspaper following the murder and investigation. In the ad, the car in which Liuzzo was murdered is offered for sale with 'bullet holes and everything still intact,' rendering it 'ideal to bring in a crowd.'" By Tyler Starr Charlotte, North Carolina: Wobble Press, 2017. Edition of 15 + 2 AP, 1 Handling Copy. 17” x 25” x 1” closed, 38 pages. Soft-cover book. Pigment print on Moab Entrada Rag Bright 300 gm. Whip stitched and perfect bound with foil stamped cover. Signed and numbered by the artist. Tyler Starr: "Redress Papers commemorates the messy and poetic process of trying to grasp an understanding of horrific attempts to address perceived wrongs in the world. This process of reengaging the past and sorting through reams of investigative documents includes free associations and open-ended conclusions. 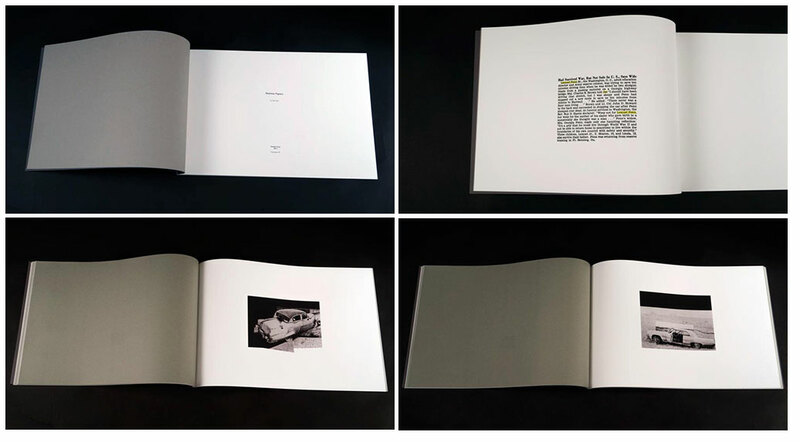 "The book is composed of photogravures including 6 depictions of vehicles in which individuals were assassinated by Ku Klux Klansmen. The murders referenced include unresolved cold cases. The victims' vehicles are reconstructed through collage of the fragments appearing in FBI documents pieced together with accurate images of the cars found in auto classifieds. Interspersed with the damaged vehicles are examples of theatrical attempts to redress humanity’s transgressions in the form of Japanese film monsters (kaiju) created at Toho studios near where Starr lived in Tokyo for seven years. "Picking up on the 'monstrosity' reference, Starr incorporated several images from Japanese films about giant monsters. …"